Let magick set you free from the people who bring you down. Difficult people make life unbearable. Whether you’re dealing with a cruel boss, a bully or a gossip, you need freedom and peace. 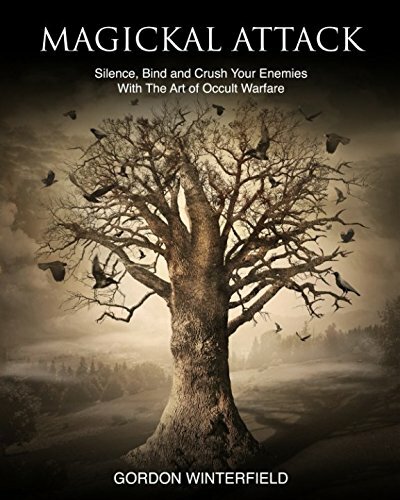 With the dark magick in this book you can silence, bind and curse the people that have made you unhappy. People are jealous, petty and cruel, and their mean-spirited actions are holding you back. Use magick to be untouched by the heartless. The eldest member of The Gallery of Magick, Gordon Winterfield, has a lifetime of experience dealing with troublesome people. He says, ‘You can turn the other cheek, but why should you? It is your divine right to remove people who get in the way of your true will.’ Using angels and demons, Magickal Attack gives you a fast, safe way to take control of those who try to run your life. The magick presented here is unique. Derived from tradition and refined in the furnace of experience, these dark workings have never been made public before. Without any complicated ceremonies, Winterfield has developed a magickal system that gets your commands to the demons without any danger to yourself. A Ritual To Wield Power that keeps you safe. Rituals to find enemies, foil plans and send torment. Magick to silence gossip and lies. A powerful binding ritual to stop an enemy from causing harm. The Master Curse, to punish without restraint. The ritual to end a relationship. The book also covers Disruption Magick, used to confuse, weaken or make others leave you undisturbed. Most importantly, the book concludes with a peace ritual, which can be used to prevent a fight from ever taking place or to bring commanding peace when you are victorious. When you gain control over those who have chosen to hurt you, you are executing an act of justice. There is great spiritual growth to be found in this dark magick, as well as the peace that you deserve.